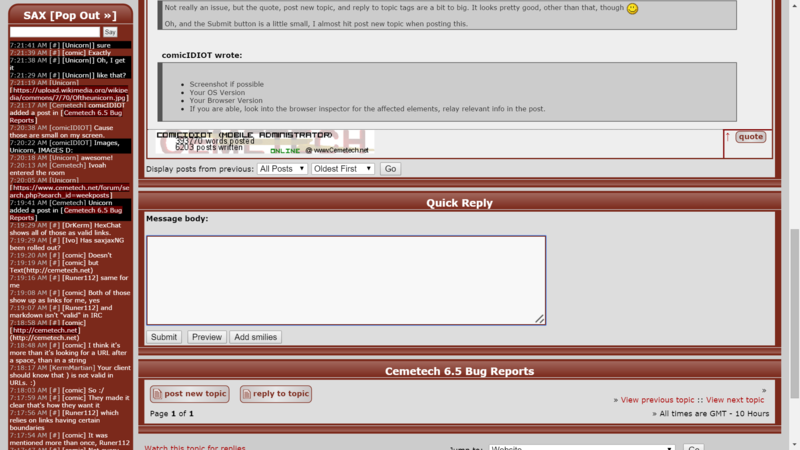 If you are able, look into the browser inspector for the affected elements, relay relevant info in the post. The more specific you are, the better we can help and fix things. If you are generic in your report, we may not fix it or it may be a few posts (with these questions/requests) before we have the relevant info. So please, be as specific and helpful as possible the first time around! Oh, and the Submit button is a little small, I almost hit post new topic when posting this. Those are all the same size for me; It's identical to how they were in the previous theme. I'm going to chalk this up to theme-shock. Haha. I won't promise it'll be addressed if more users come forward with the same issue. Topic view looks terrible. All browsers. All OSes. Yup. That's intentional. However, yours seem to be dashed instead of dotted. Version 47.0.2500.0 canary (64-bit) does not have this issue on 10.10. When I am back in 10.11, I'll recheck. Why are the lines even there? They look pretty bad IMO. Sax highlights nickname matches, which makes everything I say on IRC highlight me. Inconsistent rounded/sharp corners on page elements. Signatures seem to have a fixed height, resulting in unsightly clipping of large signatures and wasted space in small/nonexistent ones. In the mobile width view, the header is annoyingly slightly wider than all the other page elements. At zoom levels below 100%, the borders on the "post new topic, "reply to new topic," "quote," etc. buttons disappear, making them look rather odd. In the "Topic Review" page element of the post preview page, there's a reference to a nonexistent image buttimg_post in the header line for each post. Times in Sax and highlight notifications include "EDT," which seems rather unnecessary. This looks great! I assume the idea was to make the site be an example of "web design gone wrong," right? For what it's worth, for Desktop users I've created a fix using Stylebot on Chrome. I've ported it to Safari on OS X as well but don't have an easy way to share it yet. That's what your browser decided should be your native time representation. Runer: new post/new topic buttons now have a border in px instead of rem, which Chrome apparently needs to draw those button borders sanely. I don't know why, because Firefox is fine with the rem specification. Runer: Fixed consistency of element width in mobile/narrow view. Can you please try turning your background images back on in Chrome 37? I think that's why your view looks so weird. I do think that Chrome 37 is failing to understand the flexbox around the search box, so I'll keep working on that. The rounded/sharp corners are not broken (so WONTFIX): the top elements on the page have rounded corners, and the body items below have sharp corners, which is consistent throughout. The ones with sharp corners are considered visually grouped with the most recent item with rounded corners. Yay! The lines look much better now. -I'm unsure if it's just me, but the site no longer fills 100% (or close) of the window width. I kinda prefered when it did, since I saw more text in one line on my 1920x1080 monitor. Will there be options to increase the board width? 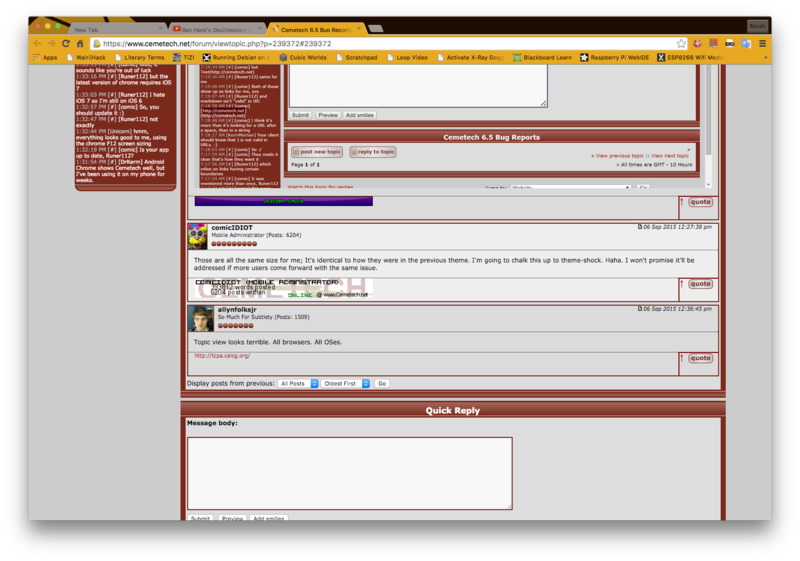 -The red borders around posts seems a little distracting. I wonder if it would look better if they were lighter in color or 1 pixels thick? A different color might look out of place, though. -Good move to restrict signature sizes. That said, maybe the height limit is a little too strict, since even Ivoah and Kerm sigs no longer fit. I can live with it, though, since signatures are nowhere close to the most important thing on a forum. Other than that, quite a lot of changes, but I'll most likely get used to them. I would say that the board width is the one I don't like much but I like how you stayed true to Cemetech 6 in style. EDIT: It also looks like I need to recofigure Adblock Plus to block SAX again, since my current filter no longer works with the new theme. Here's some more. These may not be specific to the new theme, but eh. The "Jump to" dropdown in the "Topic Review" page element is rather silly, as selecting anything takes you away from the post you're writing. Both it and the "All times are GMT +/- X Hours" elements should probably just be removed. The post "Options" that list features as on or off is neither interactive nor reflects the actual options selected with the checkboxes to the right. Some combining/removing should occur. The "RSS & Social Media" page element should be formatted like the "Logged In" element when in the mobile view. That is, the four small elements should be stacked horizontally rather than vertically. Whatever character you used for the "Delete" button isn't supported by my font. Considering neither the "Quote" nor the "Edit" buttons have symbols, is it even necessary? The spacing between the "Quote," "Edit," and "Delete" buttons look abnormal in either view. 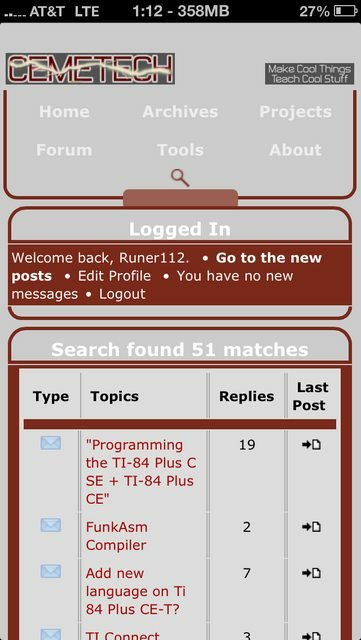 Moused-over links are formatted as maroon text on a slightly darker maroon background, making them essentially unreadable. Why the fixed size? Can it not expand to roughly fill the window? Are highlight popups really necessary? Presumably you'll see them if you're looking at the tab. The sites page is full of useless and dead links. Just remove it, and along with it, the channel/sites buttons. The delete button doesn't have an icon. Can you elaborate more on this, then? © Copyright 2000-2019 Cemetech & Christopher Mitchell :: Page Execution Time: 0.251949 seconds.